What a difference a month makes! The Sox had the Yankees in town right before the All Star break and were looking at being within 5 games of first place if they took 2 of 3 from the AL East leaders. Instead, they lost the series on Sunday afternoon and since then have been on a terrible downward spiral towards the bottom of the American League. 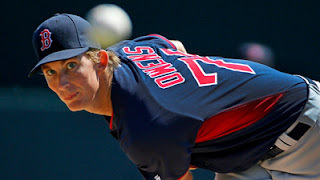 Now, as the team tries to prep for next season, they will turn to one of their young pitching prospects, Henry Owens, to make his big league debut tonight in the Bronx. Owens is ranked as the #19th overall prospect in the game according to MLB.com and the recently turned 23 year old will look to prove all the experts right that his stuff will be good enough in the majors. This season Owens has a 3-8 record but in 21 games started and over 120 innings pitched, he has an ERA of 3.16 to go along with 103 K's and a WHIP of 1.144. He'll be going up against the best lineup in baseball over the past 2 weeks. The Yankees have scored 94 runs in that time and as a team are hitting .305; leading the way is Mark Teixeira with 6 homers and having an incredible come back season. The Yankees will have Masahiro Tanaka (7-4 3.80) on the mound tonight and will try to bounce back after taking the loss last week to the Rangers.